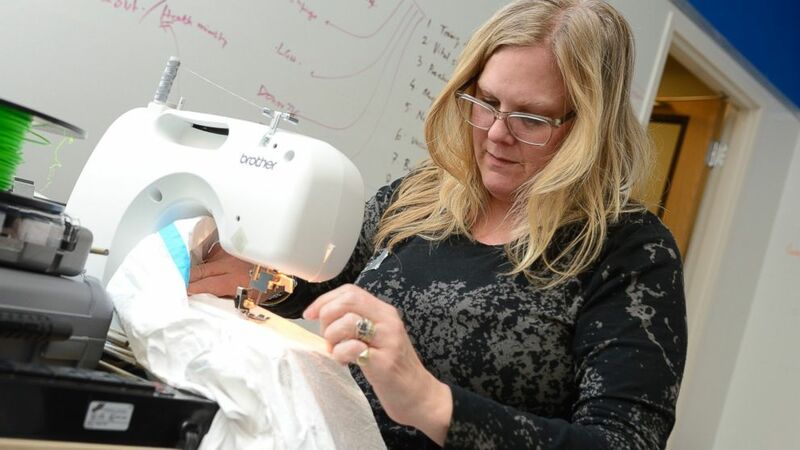 Maryland wedding designer Jill Andrews is pictured here working on a gown. A wedding dress designer is making her debut at New York fashion week today and her latest creation doesn't come with a veil. It does, however, come with a face shield. That's because Jill Andrews put her talents toward designing a better protective Ebola suit with a team at Johns Hopkins University. "It’s all engineering," Andrews told a magazine called GE Reports. "If you can build a bra, you can build a bridge." 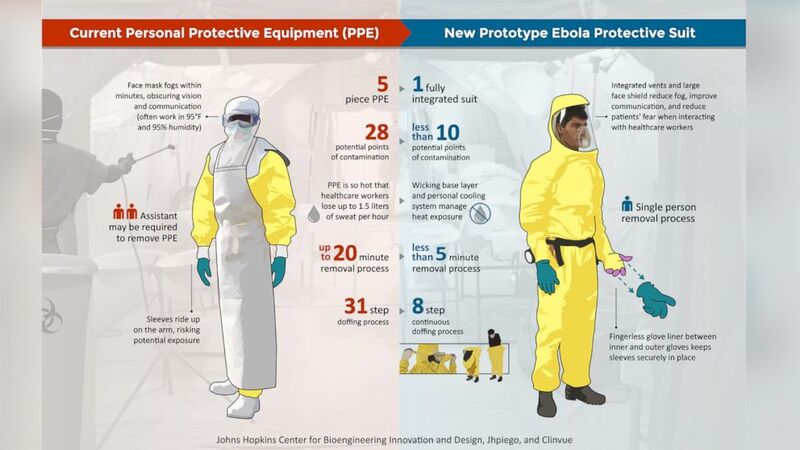 The current personal protective equipment is shown next to the new prototype Ebola protective suit in this infographic. At its largest, the team had about 80 people, and worked since October to perfect the existing Ebola suit, said project manager Matthew Petney, who works at the Johns Hopkins Center for Bioengineering Innovation and Design. Although the suit is still a work in progress, Petney said he hopes it will save time, money and energy -- not to mention that it will better protect people working with patients. The suit is one piece instead of five, and can be removed in less than five minutes instead of more than 20 minutes, according to an infographic from Johns Hopkins. 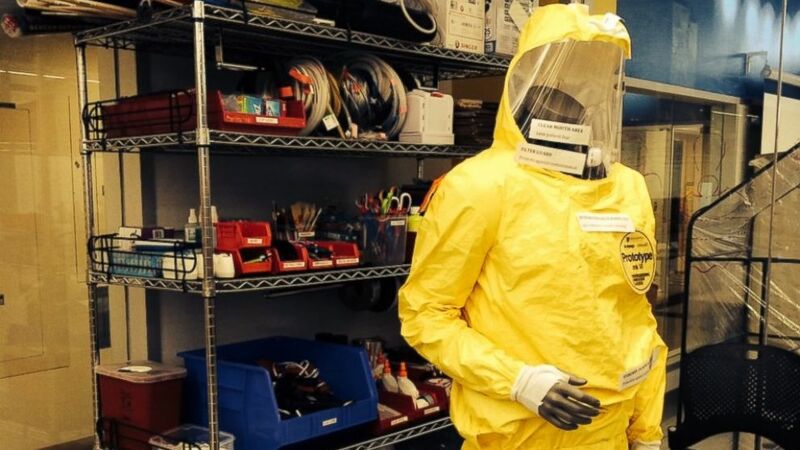 Because of this and other features of the design, the new Ebola suit would have fewer contamination points. Dr. Richard Besser, ABC News chief health and medical editor, donned full Ebola protective gear in September when he visited Liberia and became the first journalist to enter an Ebola ward. He said the suit was incredibly hot, limiting the amount of time doctors could spend with patients, and it was difficult to make eye contact with patients through the small eye opening. This new suit has a large face shield, he said. "There is something quite frightening and otherworldly about the existing suits that cover everything but the eyes," he said. A wedding dress designer is making her debut at New York fashion week, Feb. 13, 2015, and her latest creation doesn't come with a veil. Andrews said her experience making tough customized wedding gowns and working in theater helped prepare her for the Ebola suit design challenge, which involved Johns Hopkins' Jhpiego and its Center for Bioengineering Innovation and Design, as well as a medical device company, Clinvue, and the GE Foundation. "It's a different medium, but it's very much in the same world," Andrews told ABC News, explaining that designing modest gowns for the rigorous dancing of Orthodox Jewish weddings, for instance, is also a challenge. "There are lots of interesting things that people come up with that you’d be surprised," she said, "especially when I was working in the theater. I had an actress that had to do a handstand in a gown while wearing a corset." She said she loved working with a team of people coming from all different backgrounds. "I loved taking part in the whole design challenge," she said. The pop-up at New York Fashion Week is hosted by the International Rescue Committee. Jill Andrews put her talents toward designing a better protective Ebola suit with a team at Johns Hopkins University.